The second largest carmaker in India that has no presence in the Multi Purpose Vehicle (MPV) segment in the country is all prepared for the opening day of 2012 Delhi Auto Expo, which will witness the unveiling of Hyundai Motors introductory concept MPV. The uncovering will be the Global Premiere of the concept vehicle that is codenamed as HND-7 at present. 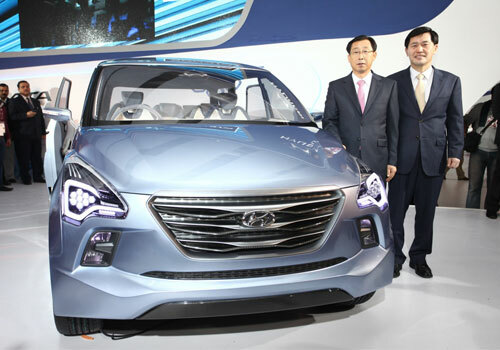 After the unwrapping, the company will be seen collecting the feedback of the visitors and then will decide upon the production date of the vehicle. Together with the concept, there are various other new Hyundai products especially three-door Hyundai Veloster sports hatchback along with New Hyundai Elantra, New Hyundai Sonata and 2012 Hyundai Tucson are expected to be displayed at the 11th Auto Expo. The one urbane element that will be common in every vehicle from Hyundai stable will be the illustration of ‘Fluidic Sculpture’, which will be awe-inspiring. The five-seater luxury saloon 2012 Hyundai Sonata also called ‘Hyundai i40’ or ‘Hyundai i45’ in some countries will be accompanied by New Hyundai Elantra sedan at the event. The D-segment car will have its rivals ready in India in the form of Skoda Laura, Honda Civic and Toyota Corolla Altis. The company is also expected to unveil second generation compact crossover Hyundai Tucson in India alongside the fluidic version of current hot seller in the country Hyundai i20 hatchback. The New Tucson may be offered under a very competitive price as the market for such compact SUV is under development in India and Korean auto major would love to take on the initiative of opening-up a new segment, as it did by introducing Hyundai Santro with a tall boy image.